We use doors every day. And, inevitably, we cross paths with others using those same entrances and exits. Opening a door for someone, holding a door open for the person behind you, or gesturing another to pass through first, is simple kindness. It’s as much of a standard of polite behavior as not crowding in a line or cutting in the path of another pedestrian on the sidewalk. The etiquette of letting someone else go first is typically taught from a very young age. Whether or not you follow this rule, you sure recognize what it feels like when others choose not to observe it. In the spirit of courtesy and in line with common sense, door etiquette is simply another aspect of being mindful of other people. When you approach a door that pulls open, reach out to open it then, continuing to hold the door open, stand aside so the person you're with may enter. When you approach a door that pushes open, go on through as you hold the door, standing aside as you continue to hold it so others may enter. First come, first serve is a general rule in door etiquette. If I arrive at the door first, I serve you by opening the door and holding it open. The exception to this is when the person approaching first needs physical assistance, in which case the person following holds the door. In public, when you see someone with arms full or who might have an obvious difficulty entering, it is kind to say, "I'll be happy to get the door for us" as you move ahead to open it. Avoid the awkwardness of prematurely holding a door open when someone is a certain distance away. This might cause her to hurry unnecessarily. Never allow a door to slam on anyone following you. At work, leave your office to greet your client or visitor yourself, and show him into your office. When your meeting is over, walk him to the door and open it for him to exit. Traditionally, in public or a social setting, a gentleman opens doors for a lady. And this is not uncommon today. Particularly in dating situations, a man enjoys showing courtesies to the apple of his eye. However, dating situations and gender roles are becoming a bit blurred in today's society. If you are out with someone for whom a traditional courtesy is not important, observe the "first come, first serve" guideline above. And if you are a woman who doesn't prefer that a gentleman hold the door for you, accept this courtesy with a polite "thank you" anyway. How can you fault someone for being nice? It is still appropriate for a man to open a car door for a woman. Actually, if you are the driver of the car (whether male or female), you are in the role of host, making it appropriate for you to open the door for your passenger to enter your vehicle. On a night out, if a woman is wearing a dress, skirt, or shoes that makes an event of entering and exiting a car, she may need some assistance. If you are her date and are unable to enter the car from the opposite side, you may enter first so she doesn't have to enter the car and then slide over (possibly making more of a scene). When people visit your home, hold the door open as you invite guests to cross the threshold into your home. And always walk guests to the door, opening it for them as you see them out. If you are hosting a business lunch at a restaurant, greet your client at the front, or stand to greet her at your table. When you lunch is over, walk your client to the front door of the restaurant, allowing him to exit before you. Revolving doors can be a hazard, so use logic. Allow your guest, date, or client to go first, then enter via the next open wing, or section. For safety's sake, do not attempt to crowd yourself into the same wing. 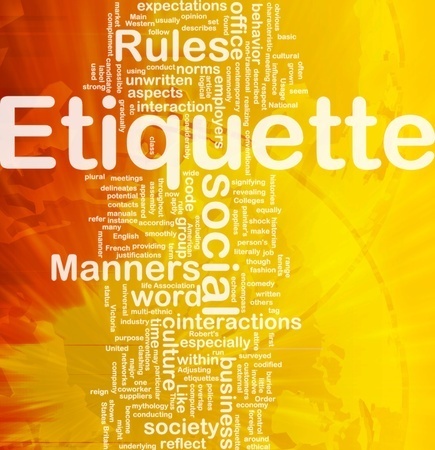 As you've read, door etiquette is mostly common sense with a dose of kindness. Practice this courtesy as you go about your business of life. Your reward will be many smiles and much gratitude.